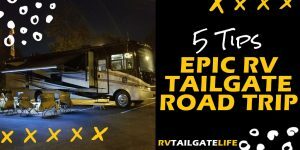 Interested in taking the leap into RV tailgating? Here are 10 things about why RV tailgating is the best kind of tailgating. And if you already have an RV, why you need to get into tailgating. Because it is the most awesome thing ever! Once you tailgate in RV style, you’ll never want to tailgate any other way! You can bring your dogs to the tailgate if you have an RV. You’ve got a clean bathroom, air conditioner for hot tailgates, heat for cold tailgates, and a bed to crash in so you don’t get any DUIs after the game. Sounds great, right? Well that’s not all the benefits. You don’t have to unpack your RV after each game, so you’ll be ready for the next game right away! And you’ve got a kitchen to prep some awesome game day meals. More on that later. Your car can comfortably fit what, 4 people? Now what about an RV??? Some RVs can comfortably entertain dozens of people at a tailgate, especially on a nice day. 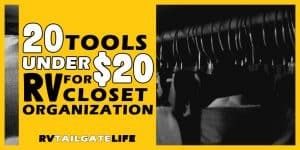 Now, get a group of RVers together and you can easily accommodate hundreds of friends and family at the tailgate! No one needs to be turned away! Once you get the tailgating bug and join an RV tailgating community, you’ll see people get married (and unfortunately divorced too), have babies, and even get to watch those babies grow up. You’ll have some of the best stories ever, including vacations both for tailgating and not for tailgating. In fact, RV tailgating is truly a great way to meet new friends as an adult. Where else will you consistently see someone new two to four weekends every month for several months? Or year in and year out at special events? And it not be centered around your kids’ school. These aren’t surface friendships you develop at an RV tailgate. You’ll get to know your new friends’ buttons, what ticks them off and what makes them smile. You’ll know their allergies. And their babies and grand-babies. How else are you going to get 30,000 people to all decide to go to Dublin, Ireland at the same time without this great community? We are talking bucket list things here people! With all your favorite friends and family around, plenty of great food and drink, and lots of entertainment, what’s not to love? Get ready for the games with a pre-game party. Celebrate the big wins with a post-game party. It’s all just one big party! Without sitting in post-game traffic! Think of the most epic backyard party and turn it up to 11! That’s an RV Tailgate! Go crazy with your RV and paint it up in your team colors. Or at least cover it in decals. 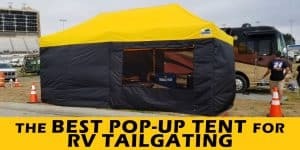 Then you have your pop-up tents, your team flags, and tailgate decor. And boy can you bring a lot more team tailgate decor when you have an RV! All those basement compartments are just waiting to be filled with tailgating gear for your favorite team! Have you ever gone to a tailgate during the day only for it to get cold by game time? With an RV, you don’t have to worry about buying new sweatshirts at the game. Or rain ponchos in the other team’s colors. Instead, you’ll have a collection of team gear in your RV. In your size. And your team’s colors. For all weather situations. You can even bring backups for friends and family. Moreover, if you do get caught in a rain storm, how awesome is it to come back to the RV and be able to change into dry clothes and keep tailgating? Or take a shower and put on dry clothes after a really hot game? Your tailgating menu is no longer limited by the size of your cooler. Or to menu items that must be made ahead of time. Now, you can take all the advantages of your home kitchen right to the tailgate when you have an RV! Want an extravagant Reese’s Peanut Butter Cheesecake for dessert at your tailgate? You can do that in the RV! Or how about a warm Crock-Pot Dump Cake ready for you when you get back from a cold winter game? We RV tailgaters can do that too! You can even bake on the spot with an RV oven, like smoked macaroni and cheese. Or keep things frozen, like homemade frozen dog treats. Your RV gives you a whole new dimension of tailgating food that you just can’t do out of the back of a pickup truck or SUV. Not even a mini-van. And yes, we all spent years tailgating that way before getting an RV. Ladies, this one is especially for you! Because who wants to use the woods? Or a porta-potty? When you go RV tailgating, you bring with you a clean (to whatever your specifications are, at least) bathroom. And you can limit who gets to use your clean bathroom. In other words, you don’t have to allow strangers to come in and make a mess of your bathroom! You can even show a bit of humor about keeping your RV bathroom clean with a funny bathroom sign. Yes, RV tailgating is so awesome you may not even want to go to the game. Why go to the game and sit in the upper deck when you can lounge in your air conditioned or heated RV (weather dependent) and watch the game on TV with instant replay? My Tiffin 34PA has 4 TVs! So not only can I watch “my” game, but I can also watch whatever other games I want to. From my couch. Or even my bed. And I have a full kitchen (ahem, full bar!) and no lines for the bathroom. So, come on down to the party, and watch the game in luxury. Just be sure to upgrade the RV TV first! Sure, football may be how you know it best. But you can also find RV tailgating at NASCAR, baseball games, and even the opera! Yes, the Santa Fe Opera actually encourages tailgating! How cool is that! That’s why RV Tailgate Life is here all year long, serving up new recipes, new destinations, and new RV tips! Why Do You Think RV Tailgating is the Best Tailgating? Comment below with some of the reasons you think that RV tailgating is the best tailgating ever!